Photo: Roberto Assim/Play the Game. ISCA is always striving to expand its reach and collaboration with organisations across the world, and soon after it was founded in 1995, ISCA established a dynamic and valuable connection with one of the biggest grassroots sport and culture organisations in Latin America, SESC (Social Service of Commerce) São Paulo in Brazil. Since the start of the new millennium, this collaboration has given rise to the establishment of ISCA’s Latin America Secretariat, the MOVE Congress 2012 in São Paulo, the Move Brasil campaign and the appointment of SESC São Paulo’s Manager of Physical and Sportive Development, Maria Luiza Souza Dias an ISCA Vice President and Latin American Chairperson. As part of our 20th anniversary interview series, ISCA speaks to Maria Luiza Souza Dias about what attracted SESC São Paulo to become an ISCA member and the successful initiatives that have helped both organisations spread their influence on sport for all development in Latin America. Q: First I will ask you how you became connected with ISCA – how did it all start? The institutional relationship between ISCA and SESC São Paulo started in 2001, when we became an ISCA member. SESC São Paulo was aware about ISCA due to the partnership between SESC São Paulo and Unicamp, a university that hosted the Secretariat of the ISCA Latin America Committee until 2008. In 1999, SESC São Paulo and Unicamp organised the first edition of the International Forum of General Gymnastics with ISCA’s support. Since then, the Forum has been held every two years and is always supported by ISCA. Q: How has ISCA helped SESC and what has SESC brought to ISCA? Since we started our cooperation with ISCA, we increased our network of contacts and partnerships and we have had the opportunity to spread SESC beyond our borders, thus expanding our mission and actions. At the same time, SESC São Paulo promoted ISCA and its values in Latin America, not only to bring new members to its network by gathering different organisations, but also to incentivise and support the development of innovative actions to promote sport for all (SFA). SESC has also brought knowledge to ISCA on the Brazilian SFA landscape and, through its events and projects, also inspired the association to develop new initiatives in SFA in Latin America. SESC and ISCA have worked together on important actions to reduce sedentarism and to promote active and healthy lifestyles. In particular, we are implementing an action plan in Latin America with the goal to gather organisations that are interested in developing SFA actions. ISCA’s Latin American based staff members, Tatiana Camargo (ISCA LA) and Pedro B. Emmanoelli, are in contact with Latin American partners to spread our action plan and to invite them to take part in it. The idea is to achieve successful partnerships with these organisations and develop future activities together. We benefit from being part of ISCA’s international umbrella, due to our interaction with its members, partner associations, and other international stakeholders and leaders in sport for all promotion. Taking the Move Brasil campaign as an example, I think it can inspire us to develop new activities, like “MOVE seniors” or “MOVE children”. Q. What kind of impact do you think ISCA has had in Brazil and Latin America? ISCA has had a positive impact in Brazil and Latin America, mainly because the association has contributed to gathering organisations to share their experiences and knowledge. We also need to mention that SESC and ISCA have a mutual contribution, where both develop important national and international actions in SFA, like the Move Brasil campaign, an action that was inspired by the European campaign NowWeMOVE. We believe Move Brasil and NowWeMOVE are having a big impact in Brazil and Europe, mainly because they are reaching thousands of people. Both campaigns have built an active network with different partners, stakeholders and leaders in SFA, which have spreading the concept and importance of this initiative in terms of education and social development through sport. Another example is Challenge Day, an international campaign coordinated by SESC on the American continent, where we had the opportunity to share with ISCA the campaign values, objectives, structure of communication and dissemination through its promotional material. Furthermore, due to the cooperation between ISCA and the “Danish Folk High Schools”, Ollerup and Viborg, each year young people from Latin America and Brazil take part in the exchange program promoted by these schools, which contributes to their social and professional development. So far, more than 170 young people from Brazil and Latin America have participated in this program. Q. Why did Brazil start its own MOVE Week and Move Brasil campaign? In its trajectory, SESC has developed several actions in different areas. In sports, for instance, we organise national and international actions like events, projects, campaigns, etc. So, considering that we have extensive experience in the field of Sport for All and also taking into account the bigger sports events Brazil is hosting in this decade, the Soccer World Cup (2014) and Olympic Games (2016), we launched the Move Brasil Campaign in 2012, which will end in 2016. As mentioned above, this initiative was inspired by the European campaign NowWeMOVE from ISCA. Q: What are your personal highlights from the time you’ve been working with ISCA? Since 2008, when I became the ISCA President of the Latin American Committee, I had the opportunity to increase our network of contacts in Latin America, as well as to connect ISCA with organisations that SESC had already approached. Then, it was possible to promote an exchange with different partners for sharing experiences and knowledge. Due to ISCA’s expertise in capacity building, advocacy and volunteering work, I can say that my participation as representative of ISCA brought me a knowledge on these relevant subjects. I am very satisfied to have the opportunity to manage with ISCA successful actions in SFA promotion, such as Executive Committee meetings, the MOVE Congress and youth projects we’ve hosted in Brasil. I am mindful of the importance of representing ISCA and also having the chance to share SESC’s experiences with the ISCA network. Q. What do you look forward to in the future? We hope to continue establishing new and strong partnerships as well as strengthening the ones we already have, besides organising and supporting more innovative activities and projects. We’ll work to find different ways to attend, along with other partners, to the needs in the field of SFA in Latin America, aiming to establish a solid and effective presence of ISCA in Latin America. In addition, our goal is to gather good practices to promote exchanges and also to be able to influence public policies in a positive way. We will work to reinforce our institutional proposition to improve Brazilians’ quality of life, emphasising the fundamental aspects of sport and physical activity in society and to expand the network of cities and people who are engaged in promoting healthier lifestyles. 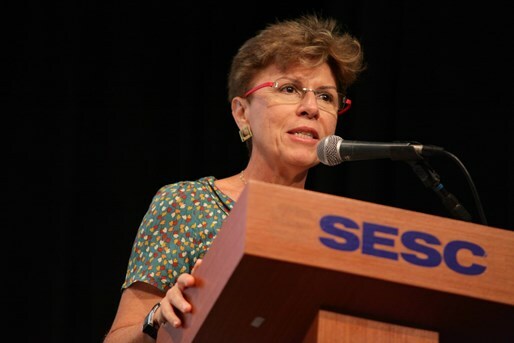 2008 – Maria Luiza Souza Dias, representing SESC, is elected as ISCA President of the Latin American Committee and SESC starts to host the Latin American Committee Secretariat with Tatiana Camargo’s support as Secretary of this Committee.